Dr. Wilson graduated from the University of South Florida College of Medicine in 1985 and trained in Family Practice. Dr. Wilson specializes in optimizing peripheral thyroid function, body temperature, and well-being. Working with more than 5,000 patients, he has developed a new simplified paradigm for thyroid management and was the first doctor to use sustained-release liothyronine. For more than 20 years he has educated more than 2,500 physicians about the use of sustained-release liothyronine for patients with symptoms of low thyroid and low body temperature despite having normal blood tests. His novel treatment of using sustained-release T3 is now standard of care with a subsection of physicians practicing complementary and alternative medicine and his work is being taught in naturopathic medical schools. 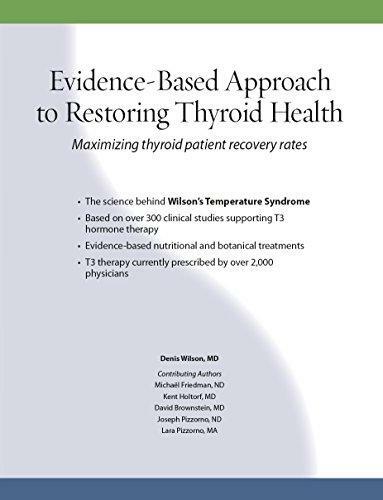 Dr. Wilson is the author of 3 books, including the extensively referenced: Evidence-Based Approach to Restoring Thyroid Health. He is also the co-founder of an herbal supplement company that focuses on restoring health with certified organic formulas.